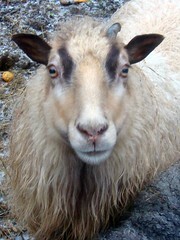 Why do I own a sheep named Minx? Have I told this story before? 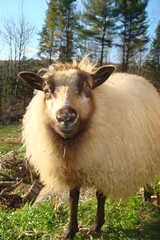 Way back in 2004 when we were looking to get three Icelandic sheep, Frank found someone in Temple, NH who had three registered for sale. She said her husband had recently died and they were his hobby. She had one ram (Sue) and two ewes, Kaytla and Fiona. 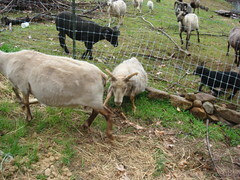 When we got there, we saw the ewes in a pen with a bunch of younger sheep, and one little lamb that was out of the pen. She was just adorable, prancing around, friendly, naughty. She went in and out of the pen as she pleased. We melted. Aw! Can you tell we weren’t yet farmers? We were gardeners with bees, looking to have a few sheep to help us keep down the brush. We made an offer on the adults, she took it and gave us all their lambs. So we bought eight sheep, not three, that day. We brought them home about two weeks later, with a couple of electric fences and um, I think that’s it. We built sheds after they got here. Minx and her mama Kaytla are fence busters extraordinaire. Half the time that next year, Minx just followed Frank around wherever he went. It was almost impossible for us to keep her in a fence. Kaytla learned quickly how to pull the electric lead off of the fence, disconnecting it from the battery. She taught Minx. When I learned to put it out of their reach, they’d sit there and stare at it for hours, convinced the solution would appear to them shortly. Minx has one daughter who we’ve kept, Lily, and she is the same way as her mama and grandma, of course. What seems to happen, though, is that eventually they get too big to get out of most places, because they go under fences whenever they can. Minx only has one scur because she ripped off the other numerous times escaping. I keep waiting for that to happen to Lily, but luckily it hasn’t. I think we are slowly getting better at fixing the fences. Slowly. Despite all that fencing breaking, they are just the sweetest, smartest, friendliest sheep we have. Even though I may say some colorful things to them all when they get out and eat my garden, I’m still glad we have them. They make my day, almost every day. I love having them out with Elly Mae again right now, because I get all sorts of cuddle time with them morning and night, even in today’s freezing rain! This entry was posted in Ewes, Icelandic, Sheep. Bookmark the permalink. Post a comment or leave a trackback: Trackback URL.